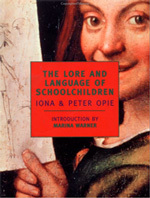 A remarkable study of the oral folklore of kids, some of which has been passed on for centuries, solely by word of mouth and strictly child-to-child. I recognized some of the English traditions from my own childhood in New Zealand; since this sort of stuff was never written down until the Opies got started, they were probably bought over by children emigrating from England a hundred years before. Some of the Opies’ highlights follow. With feathers long and wavy. And makes its nest in gravy. ¿Cuándo la gallina cruza la carretera? Waarom steekt een kip de weg over? His shoes were full of feet. On April 1st, known as Huntigowk Day in Scotland, one sends the unsuspecting on spurious errands; for example, to procure a long stand, or cooking glue, or a bucket of blue steam, or striped paint. In Northern England, one’s baby teeth, when lost, are burned with salt. If they were left unburned, a dog might find and eat them, and dog teeth would grow in their place. Or, one might have to search for them in a pail of blood in Hell. So burn those teeth. This entry was posted in Fleeting Enthusiasms and tagged Fave on 23 Jan 2005 by Mike. What, if Anything, is Big Bird?